The Mandarin Oriental, Taipei is the most luxurious hotel in Taipei. After having stayed at the Mandarin Oriental, Singapore multiple times, I have fallen in love with the brand that epitomises the legendary service that is well-known for. The Mandarin Oriental, Taipei is located within Taipei's most established business district (Dunhua North Road) and it is famous for the lush canopy of trees in the vicinity. The first thing you will notice as you arrive at this property is the beautiful European-style architecture. The exquisite design brings about a blend of classical influences with contemporary luxury that is coupled with the Mandarin Oriental's established service levels. The next thing you will notice as you walk through the front doors of this hotel is the gigantic chandelier (1,400 kilograms) that hangs above you. With a diameter of 4 metres, the monumental piece is a combination of 50,000 crystal beads pieces that took over nine months to design and assemble. During my trip to Taipei this year, I stayed in a Club Deluxe Room at the Mandarin Oriental, Taipei. The Club Deluxe Room (which comes with Oriental Club privileges - more on this later) is approximately 55sqm - this is a lot larger than what most hotel rooms typically are in Taipei. I was also fortunate enough to be placed on one of the special floors where the ceiling is apparently a lot higher, creating a ever great sense of space and opulence. When I first stepped into the room, the lights faded in on its own and the curtains opened automatically. No matter how cliché it may seem, there was truly a little bit of magic in that. This room can sleep 2 adults and 1 child very comfortably and a rollaway bed can be added without causing any obstruction to the room at all (if required). Apart from the luscious décor and the incredibly fluffy bed (reminiscent of the ones at the Mandarin Oriental, Singapore), you will also find a control panel by the bed where you are able to control the lighting (including the dimness), curtains as well other privacy controls. As mentioned, the bed itself is amazing and it comes with a goose and feather down duvet with pillows that I wish I could take home with me. I also found a welcome fruit platter on the table and to be very honest, I thought this was pretty underwhelming. Being such an extravagant hotel, I would have expected a little bit more on the plate (like the ridiculously big one I got while staying at the Crowne Plaza Changi Airport's Pool Suite). For those in need of entertainment and music, the Club Deluxe Room at the Mandarin Oriental, Taipei comes furnished with a huge 46" LED TV with digital content and it is also connected to an in-room entertainment system which allows integration of iPod or MP3. There is also a huge work desk should you require to get some work done and a state-of-the-art IP Phone by the side where you can call for room service and request for any help easily. If you have devices that are internet-deprived and power-hungry like me, you will be pleased to find a number of universal power sockets (with USB charging) by the table. The high-speed wireless internet connection also allows you to connect up to six devices. Tea in the Club Deluxe Room is provided by Cha Cha Thé (采采食茶文化), a luxury boutique tea company that is well known for their range of artisanal teas and desserts at the physical store. The packaging features a contemporary design with traces of Asian-design - I'm fully sold! If you are a coffee drinker, the room also comes with an illy coffee machine that makes delicious espressos. Finally, my favourite part of the bathroom in my Club Deluxe Room at the Mandarin Oriental, Taipei - the large and incredibly luxurious marble bathroom. If this does not make you feel special, I am not sure what else would. The bathroom features a massive (and separate) bathtub with a walk-in rainforest shower on the side. In fact, there are three different shower heads that you can utilise depending on which one you favour the most. Also, despite having such a big tub, it did not actually take too long to fill so you don't have to worry about waiting. Also, should you forget your bath salts/bubble bars, the Mandarin Oriental, Taipei provides three different scented bath salts on the side. If you run out of them just call your friendly housekeeper to send some up! Decent-sized bath amenities are also provided and if you are wondering what brand of amenities it is, check out the photo below! That's right! Bath Amenities at the Mandarin Oriental, Taipei are provided by the legendary French perfume company, Diptyque. They come in handsome 75ml bottles so there's plenty for you to make a bubble bath for your tub - remember you are on a holiday after all! Also remember that these are replenished during the evening turndowns and morning refreshes so you will have plenty to indulge in! I checked out the Oriental Club while it was serving Afternoon Tea and I was delighted to find out that I was able to choose between a sit outside or indoors. Since it was a pleasant (and cooling) afternoon, I decided to grab a seat outside while soaking in the sights of the European architecture. While the Evening Cocktails are generally my favourite time of the day, Afternoon Tea at the Mandarin Oriental, Taipei was actually my personal favourite. It was such a lavish event with delicious tea, canapés and sweets. In fact, this was where I declared that I had the best ever tasting scones in my life. There was a fine selection of sweet and savoury snacks (that were all really well executed), a fine selection of tea and coffee as well as a carefully curated range of reading materials. The use of caviar in many of the dishes offered during Afternoon Tea just added to the lavishness of the whole experience at the Mandarin Oriental, Taipei. Every single dish that was served in the Oriental Club also looks picture-perfect and almost too pretty to consume. In the evening, cocktails and canapés are also served at the Oriental Club (if you are a club guest). Since it was raining outside in the evening, I settled for a table indoors. Surprisingly, there were not many hotel guests while I was there and therefore, this was one of the least crowded hotel lounges I have ever been to. Evening cocktails are usually the busiest time of the day for most hotels since no one can ever say no to free-flowing cocktails. Forget your usual Moët & Chandon, the Mandarin Oriental, Taipei serves one of the best Champagne from the oldest established Champagne house in the world - Ruinart. If you are a fan of the harder and stronger stuff, indulge in quality tequila from Patron (my personal favourite!) or ask for a recommendation from one of the friendly Oriental Club staff. While the drinks are pretty impressive in the evening at the Oriental Club, I have to say that I was a tad disappointed with the quality and variety of food offered. Having been to the Oriental Club at the Mandarin Oriental, Singapore where I was blown away, I had my hopes up for this property. Apart from serving some nuts, chips and pickles, there was also a small selection of cheese, desserts and one hot food item. Since it was pouring outside, I was actually hoping that the food in the lounge would suffice for a small dinner but unfortunately that was not the case. After returning to my room hungry and being extremely unmotivated to head out because of the rain (and alcohol), I decided to stay in and order some room service instead. I ordered the (from the left) Wok-fried Rice (NT$500++), Taiwanese Beef Noodles Soup (NT$550++) and Ya Ge Crispy Chicken (NT$850++) which came up to approximately S$110 after taxes. Not exactly the most affordable dinner in Taipei (especially since food from outside were a fraction of the cost) but boy was that Ya Ge Crispy Chicken good! The Wok-fried Rice was delicious but the prawns were overcooked. The beef noodles were great (and the soup was comforting especially while watching the heavy downpour) and the beef was especially tender. What stood out the most however was that plate of (half) Ye Ge Crispy Chicken. They were not kidding about the crispiness of that skin and the moist meat underneath that was packed with flavours. That dish alone is a good enough reason for you to order some room service (or simply head down to Ya Ge). 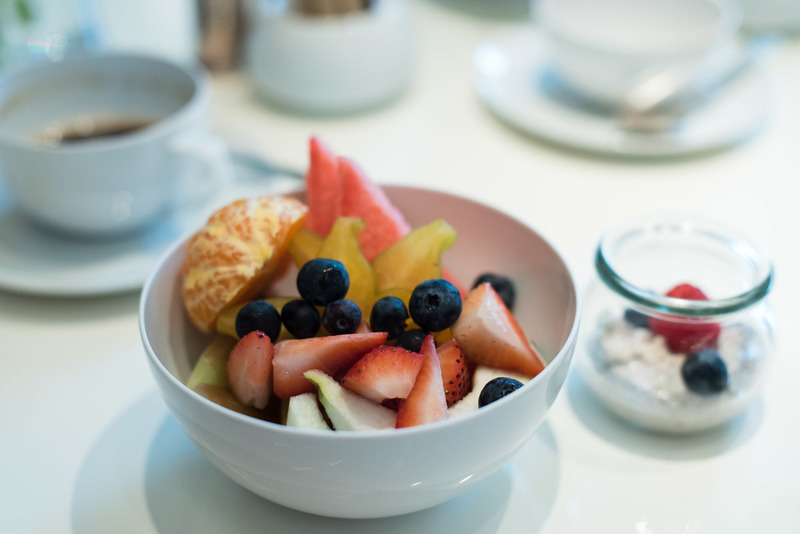 As an Oriental Club guest, you will be given an option to either have breakfast in the exclusive Oriental Club or enjoy a wider variety of food options in Café Un Deux Trois (630am to 1030am). I personally preferred the latter and decided to head down to enjoy breakfast instead (especially since I expected the occupancy during my stay to be on the lower side). Do note that there is a dress code at the Mandarin Oriental, Taipei so don't go wandering down in your shorts and slippers (which we Singaporeans are often so guilty of). Featuring design that is reminiscent of a traditional brasserie, Café Un Deux Trois is also open for lunch and dinner. In the morning, you will find delicious French pastries and bread here - trust me, I've had one of the best chocolate croissants I have ever had in my life here. At this point I was already thinking to myself that the Mandarin Oriental, Taipei has possibly the best pastries and tarts in town. There was a healthy selection of buffet items that were on offer. If you are not satisfied with it, you can always order more from the a la carte menu (inclusive in the buffet breakfast price). I tried the Congee with Chicken (NT$350++) and was pleasantly surprised by the thick consistency and flavourful spoonfuls of congee. 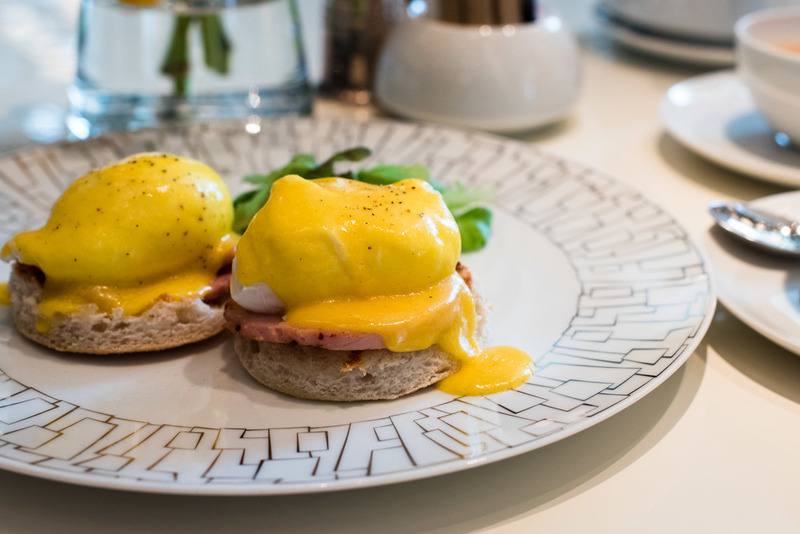 I also managed to try the Classic Eggs Benedict (NT$350++) which did not disappoint - a running golden center with a beautiful hollandaise. Finally of course, I had to have my Taiwanese Pancake (NT$400++) fix which is made from free-range eggs with a tuna center. On a sunny day, check out the iconic outdoor swimming pool at the Mandarin Oriental, Taipei while you take in the sights of the beautiful architecture while working on a tan. Tanning lotions and sunscreen is also provided by the pool if you forgot to bring yours. The Mandarin Oriental, Taipei is by far the most luxurious hotel that I have stayed in Taipei. While the location of the hotel isn't particularly good if you would like to commute on foot, many of the attractions are still easily accessible via the train. Honestly though, for the price you are paying at this property, you should be spending more time within the hotel in order to fully utilise the facilities.